Background & Objective: Gliomas constitute 81% of malignant brain tumors and exhibit a poor prognosis. Two main events involved in the progression of gliomas are the deregulation of genes via genetic events and the cellular damage resulting from the formation of reactive oxygen species (ROS). 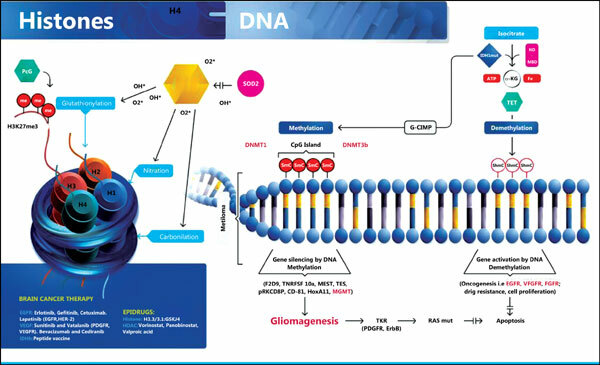 In gliomas, epigenetic abnormalities implicated in the deregulation of deoxyribonucleic acid (DNA) methylation, nucleosome rearrangement, and acetylation of histones, have been depicted. The overproduction of ROS has been implicated in the promotion of these modifications. Conclusion: In this review, we discuss the epigenetic mechanisms and oxidative events that impact gene silencing and its association with the establishment and development of gliomas. Some of these epigenetic marks, or their related proteins, are under investigation for their potential use as biomarkers in clinical trials to propose personalized therapies for patients with glioblastoma. Keywords: Brain tumors, clinical trials, epigenetics, glioma, malignant, oxidative stress. Keywords:Brain tumors, clinical trials, epigenetics, glioma, malignant, oxidative stress. Abstract:Background & Objective: Gliomas constitute 81% of malignant brain tumors and exhibit a poor prognosis. Two main events involved in the progression of gliomas are the deregulation of genes via genetic events and the cellular damage resulting from the formation of reactive oxygen species (ROS). In gliomas, epigenetic abnormalities implicated in the deregulation of deoxyribonucleic acid (DNA) methylation, nucleosome rearrangement, and acetylation of histones, have been depicted. The overproduction of ROS has been implicated in the promotion of these modifications.